Due to the inclement British summertime weather, this week's Image of the Week is from a couple of week's ago. 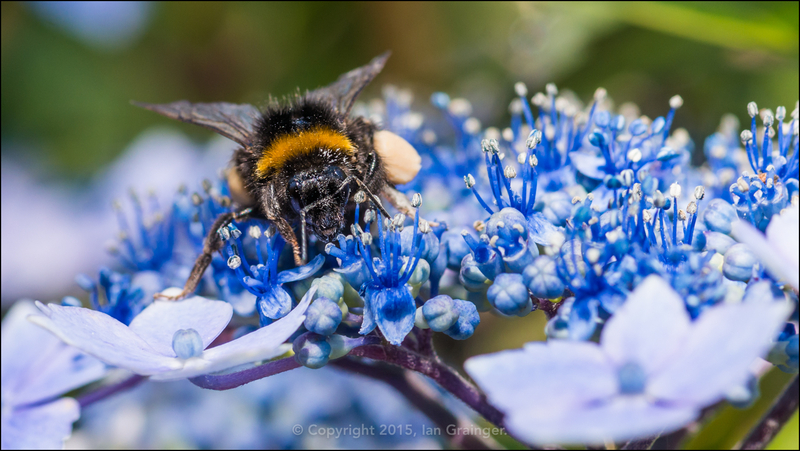 About the only things to have enjoyed the copious amounts of rain that have fallen in recent weeks have been the hydrangeas, and during every break in the downpours, they've been covered in bumblebees harvesting pollen. This particular bumblebee must have visited every single small flower spike you see here to add so much pollen to its bulging pollen sacks! I was particularly pleased to get a sharp shot of the insect facing me as focussing was quite difficult because the bee never stopped moving in its quest for pollen.